A smart designed small garden shed with large hinged access door for easy access. 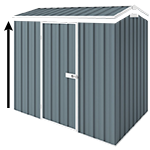 The YardSaver S53 Garden Shed is a smart designed small sized garden shed perfect for limited spaces. This 1.76m x 1.07m, 1.8m wall height slope roof garden storage unit is perfect for your gardening gear, including your mower, blower, whipper-snipper and gardening tools. Because we're in a rental home, I couldn't mount the shed on a concrete base. Instead, I used recycled palettes fastened into the ground using the equivalent of tent pegs and screwed the back of the shed into a fence wall. Assembly was easy enough and the instructions were clear. I found the videos quite useful as well. I was a bit concerned about leaks, but there were none, even though we've had some pretty wild weather in Melbourne recently. Easy to assemble shed with easy to read instructions. Great little shed to keep my pool chemicals and equipment safe and out of sight. The house we moved into has a space saver shed size 1.76x1.07single door just wondering if I can remove 1wall and join another shed same together ? It is not advisable although it is possible. Removing one wall (part or whole) to join two sheds together may weaken the structure.